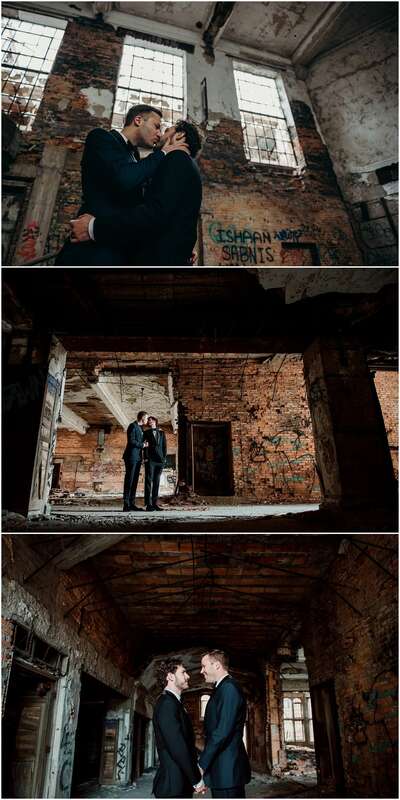 When Matt and Matthew reached out to me with a request for an urban decay couples session, I knew the perfect location. 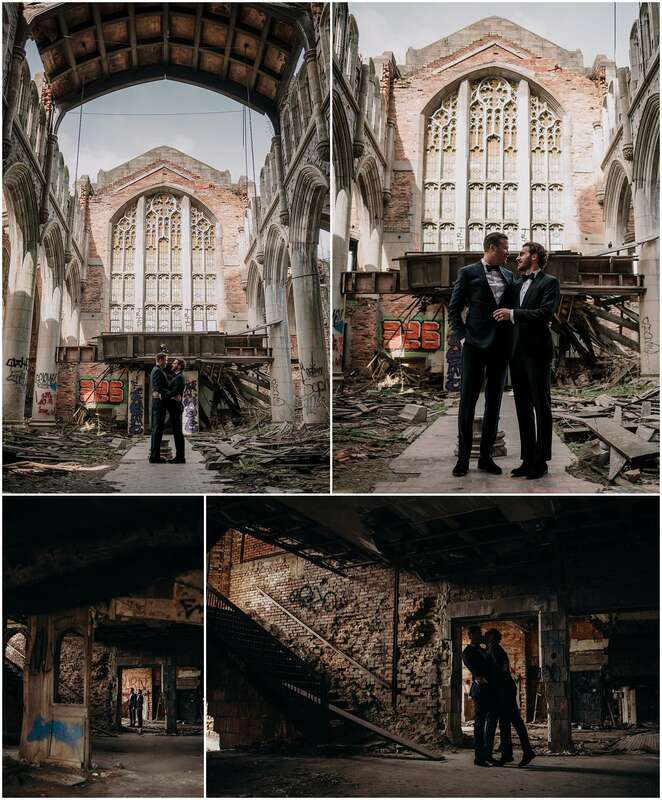 I was so excited to finally be able to do a couples shoot at City Methodist Church in Gary, Indiana. When I started getting into photography in college, I was really into urban decay and exploring abandoned buildings. I love the textures, mood, and colors of these run-down locations. So naturally, Gary was one of my favorite places to photograph. We met on St. Patrick’s Day weekend in Chicago. Matthew was visiting from Melbourne, looking to possibly start a new role in the city. We met at Roscoe’s, and we kept making eye contact from across the bar, but we were too nervous to approach each other. Matthew’s friend actually came up to me and put us in contact and the rest is history! A first and second date followed quickly after and then Matthew took the job in Chicago! Matthew moved in with me 6 months later, and we got engaged 1 year after that. Matt proposed to Matthew while we were on a trip to New Zealand. At a hip restaurant in Auckland, Matt waited until Matthew went to the restroom, and he placed a box with the ring in front of his seat for his return. When Matthew got back, he was excited because he thought the restaurant had given them chocolates to take home! Soon he found out it was more than that! Why did you choose City Methodist Church for your session? We knew from the beginning we wanted an urban decay couples session…we didn’t want any of the “classic” shoots people do in Chicago. There is something very beautiful about the textures and light found in buildings that have been left behind…almost forgotten in time. 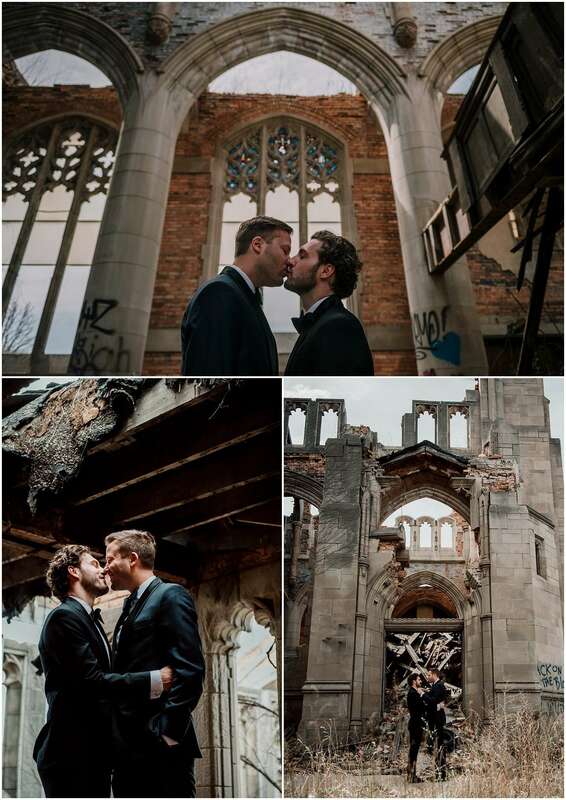 When Melissa suggested the City Methodist Church, we knew she understood us perfectly. When we finally saw the venue in person, it was even more special than we originally imagined. The shots were dramatic but intimate at the same time. What was the biggest challenge you faced when planning your session? Just timing in Matthew’s and I’s schedules. We were planning not one, but two wedding celebrations in both Chicago and Melbourne, so timing was everything!